Chris and Sonja - The Sweet Seattle Life: Great Picks! I just read an article about a website called Great Plant Picks which is a group of gardeners from the Pacific Northwest who band together to pick their very favorite trees, shrubs, and flowers. The 2008 picks have just come out, all 600 of them. My, it would be lovely to have a garden someday. This small, fragile-looking fern is incredibly tough once it is established. Its diminutive evergreen fronds remain in good shape year-round and form adorable short tufts of green. For such a little guy, it sure gets around, for it is native throughout the northern hemisphere. Although not very common in our region, it does occur in some mountainous locations. Maidenhair spleenwort is an excellent choice for containers combined with other small plants to create a miniature landscape. It is a natural for the cracks and crevices of rockeries, softening the hard edges and adding a tuft of green. Use it along path edges in the woodland garden. It is one of the few plants that will tolerate dry shady sites once well established. 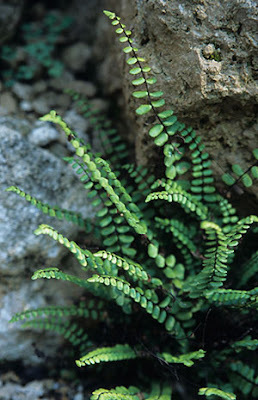 This easy but slow-growing fern performs well in partial or full shade. It grows fastest in fertile, humus-rich, well-drained soil, but it grows well in most soil types except those that become waterlogged. It is drought tolerant once established. This clump-forming perennial fern develops into a rounded tuft of short, evergreen fronds. A mature plant will only be about 6 to 8 inches tall 6 to 10 inches wide. It has a very fine texture in the garden. Fargesia robusta grows best in fertile, moisture retentive soil. In hotter areas it may need protection from the afternoon sun. It can easily be pruned to nearly any shape. If a narrow, upright screen is desired, cut the top 2 to 4 feet off of the culms that weep out around the perimeter. Without the weight of the top foliage, the culms will spring-back and stand more upright. Culms can be cut at ground level to reduce the overall width or density of the clump. The new shoots of Fargesia robusta initially have tightly overlapping culm sheaths which are deep burgundy at the margins, fading to pink and tan in the middle and pastel green near the tips when they emerge in spring and are covered with tiny, brownish hairs. As they extend up a few feet, green culms are exposed and the culm sheaths fade to whitish-tan, creating a beautiful checker-like color pattern. This pattern persists until mid summer when the culms sheaths finally fall off. By May, the new culms have reached their full height, often a couple feet taller than the original plant. The leaves are narrow, lance-shaped, finely tapering mid-green and the canes are 1 inch in diameter. Ten year height and width of clumps equals 15-17 feet. • Campsis x tagliabuana 'Madame Galen.' A trumpet vine with hot-colored, exotic flowers so lush you can't believe it thrives north of Mexico. Hummingbirds love its gorgeous flowers, it'll tolerate drought and poor soil, and you can prune it hard to control size. • Fargesia robusta. 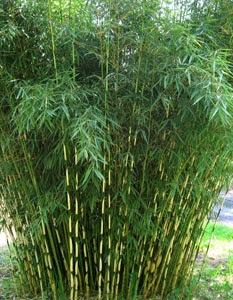 I was relieved to see this non-running bamboo get the stamp of approval, because I've already planted a hedge of it. No need to be afraid of this beauty with shiny olive leaves and white stem sheaths because it tops out at 15 to 18 feet tall and spreads politely into well-behaved clumps. • Enkianthus perulatus. This is the shrub everyone will exclaim over in your fall garden, for its tidy leaves turn pure scarlet as the weather cools. Smaller than most enkianthus, it has white urn-shaped flowers in spring and a mounded, layered shape ideal for urban gardens. • Heptacodium miconioides. The seven sons tree from China made the cut for its bright red calyxes that follow the jasmine-scented white flowers in autumn. It also doesn't hurt that this is a healthy tree, has handsome peeling bark and attracts butterflies. "There's nothing like it," one juror said. • Arisarum proboscideum. A woodland perennial proves that even jaded GPP judges succumb to the adorability factor. In April, it sprouts maroon and white flowers partly hidden beneath its leaves, with 7-inch-long "tails" that earn it the common name of mouse plant. • Begonia grandis. Believe it or not, a showstopping hardy begonia, with huge leaves and sweet pink and white flowers from July until frost. • Lonicera pileata. This versatile, tough shrub is a honeysuckle but not a vine. It stays under 3 feet, can be sheared, is an ideal backdrop for perennials and has large, bright purple berries in August. Great picks! I need both of them. Looks like a terrific resource.